If you’ve followed all the available troubleshooting for your version of Minecraft and you still have a problem, you may have found a bug. Here’s how to submit a bug for the Minecraft team to investigate. If you’ve run into a problem, it’s highly likely that someone else has already reported it. 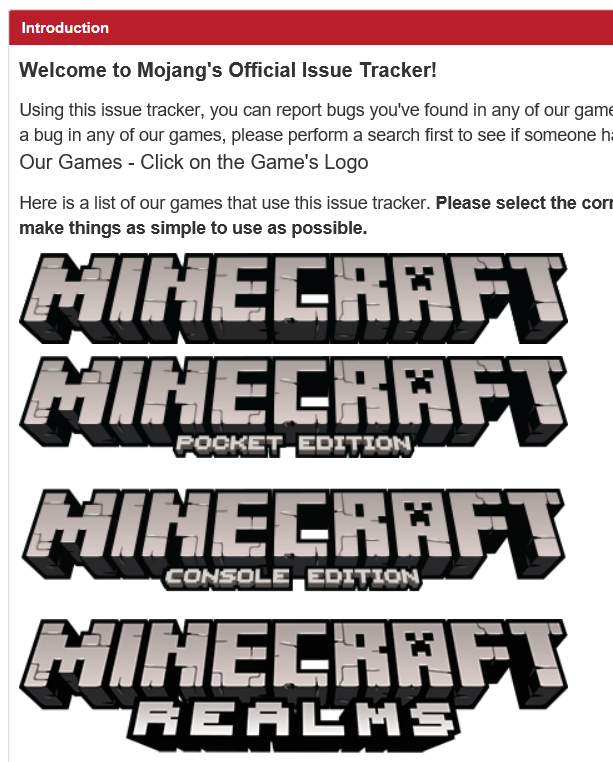 To see a list of bugs that have been filed and actively being investigated, type your problem into the search bar at the top of the page at bugs.mojang.com. Try to be as detailed as you can, include error codes if applicable, and also the version of the game where you’re seeing the problem. If your problem has already been submitted, you can see additional details about the progress of that bug, and if/when it will be resolved. If you don’t see your problem already listed, either Create a new account or Sign into your account. 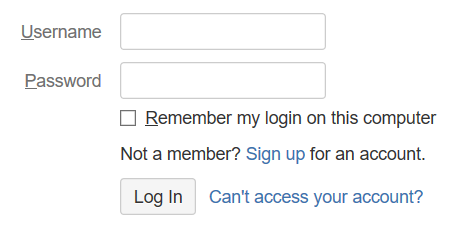 To submit a bug, you’ll need to create an account. 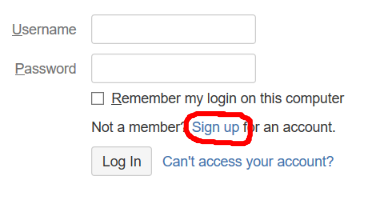 If you already have an account, see the Sign into your account section below. Note This is not the same as your existing Mojang or Microsoft account. If you’ve never submitted a bug before, you won’t have an existing account. Go to bugs.mojang.com and select the link to Sign up for an account. On the account sign up page, enter your Email, Full name, Username and Password and complete the image verification before selecting Sign up. You’ll receive an email to the address that you provided with a link for authentication. Either select that link or copy and paste it into your web browser to confirm your account. 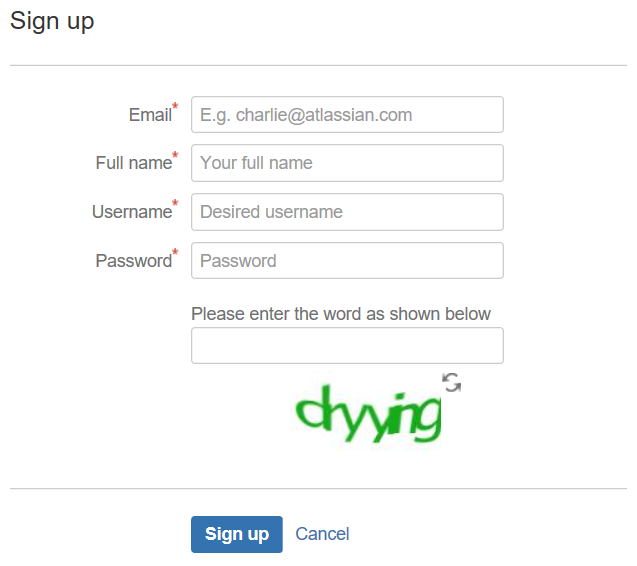 If you’ve submitted a bug before, enter your Username and Password to sign into the bug portal. If you’re having problems signing in, see the Problems signing into your account section below. Once you’re signed in, select Create at the top of the screen to create a new bug. Project: Select the version of Minecraft you’re are having a problem with. Summary: Provide a short description of the problem you’re having. Affects Version/s: Select the version of the game you’re having a problem with. You can usually find this on the main menu of the game. Description: Here is where you will enter a full description of the problem you are having, and why you think this is a bug. Include as much detailed info on how to reproduce or get to the problem as you can. Attachment: If you have a screenshot or an image that will help articulate your problem, you can attach it here. Once you’ve completed the form, select Create to submit it to the Minecraft team. You’ll be able to track the progress by selecting your profile from the top-right corner of the page. Your active bugs will be listed under Activity Stream, where you can see the status of your bug submission. 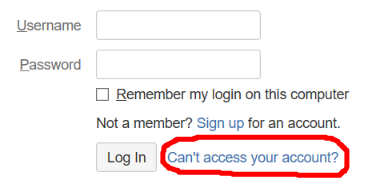 If you’re having problems signing into your account, select “Can’t access your account?” from the login screen. If you have forgotten your password then enter your username and select Send. If you have forgotten your username then enter your email address and select Send. You’ll be contacted at your registered email address with guidance on how to get back into your account. Would you like to contact Support regarding the "How to report a Minecraft bug" issue you were reading about or a different issue?